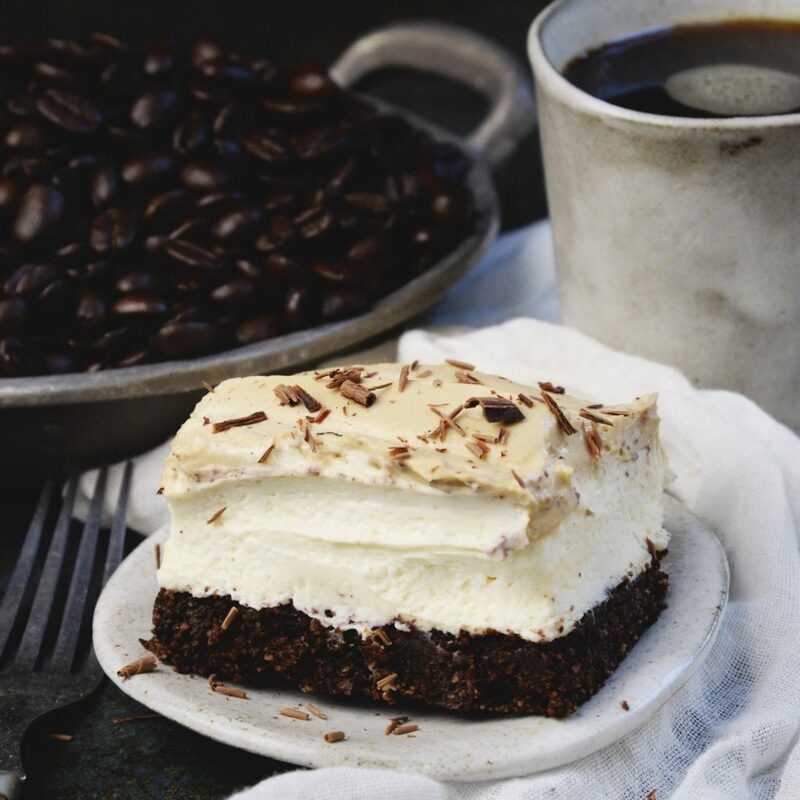 This Low-Carb Cappuccino Mousse Cake boasts a chocolate cookie crust, a layer of cheesecake mousse, and is topped with cloud of coffee mousse. This make-ahead dessert can still be part of low-carb, keto, Atkins, gluten-free, grain-free, and Banting diets. Need an easy dessert that won’t blow your macros? 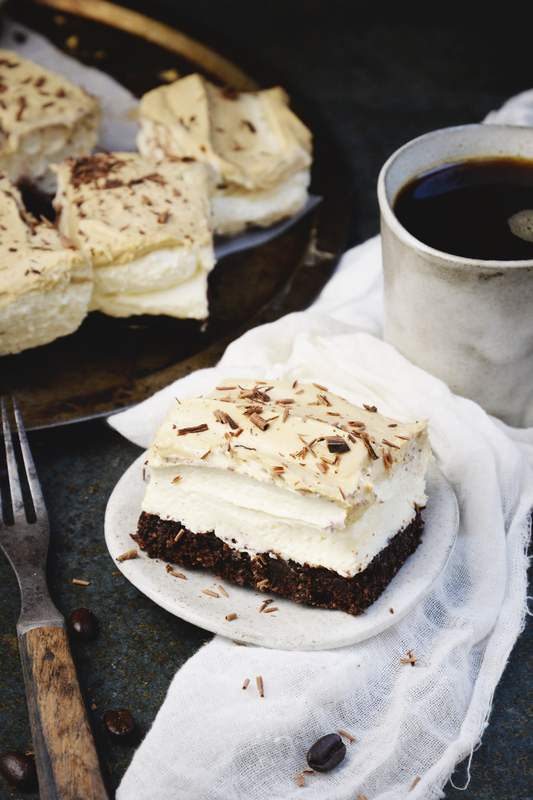 This Low-Carb Cappuccino Mousse Cake may just fit the bill! 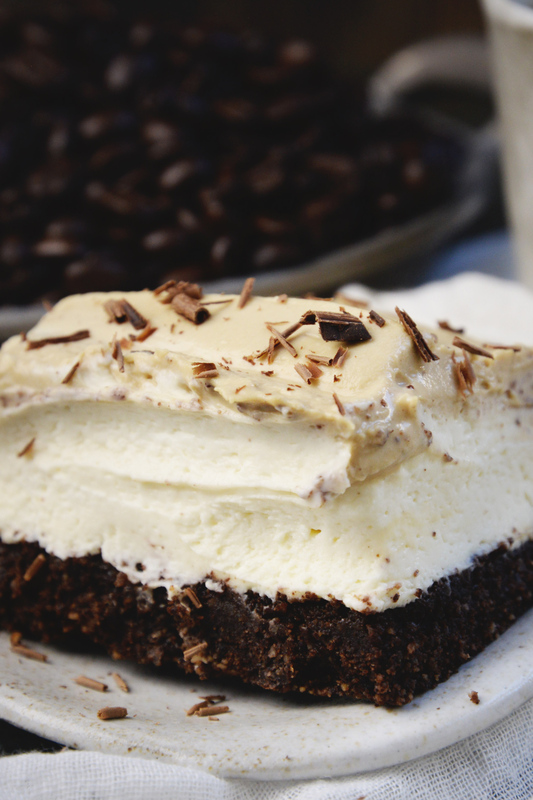 This cake boasts a chocolate cookie crust layered with creamy cheesecake mousse and crowned with cappuccino love! If you like, you can sprinkle just a bit of chopped chocolate on top, because, well, why not? This cake may look impressive and taste even better, but it’s really quite simple to make. The dough for the cookie crust is made in the food processor. What could be easier? You will want to make this cake well before you want to serve it. It needs to refrigerate at least 5 hours or so to set. Overnight is even better. The wait is the toughest part of the recipe. In the meantime, you can lick out the bowl. The inspiration for this recipe came from a recipe I saw in last month’s Southern Living Magazine. They had a recipe for a Cappuccino Swirl bar that made me drool all over the page. Of course, the recipe wasn’t low-carb at all. Not only did it use regular sugar as the sweetener, it had a crust made from crushed up purchased cookies. Still, I loved the idea of a layered bar, so I set out to make a low-carb version. First, I altered my recipe for Low-Carb Thin Mint Cookies to make the chocolate crust. Instead of baking it as cookies, then crushing them to make the crust, I simply spread the batter right in the baking dish. 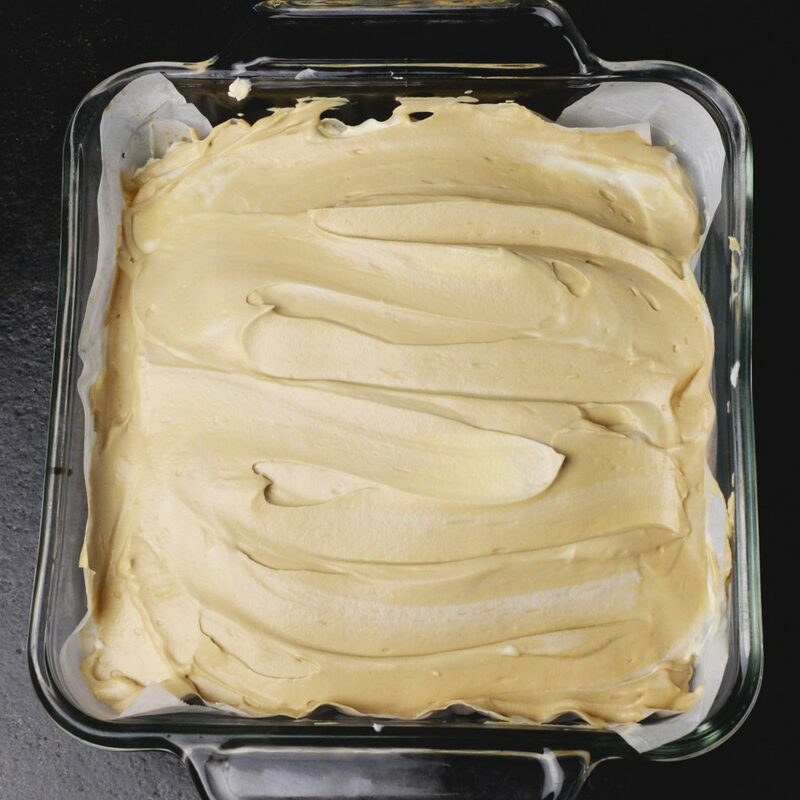 For the cheesecake portion, I altered my recipe for Keto-Friendly Low-Carb Peanut Butter Mousse. The new version made a delicious creamy base which I divide to make the layers. 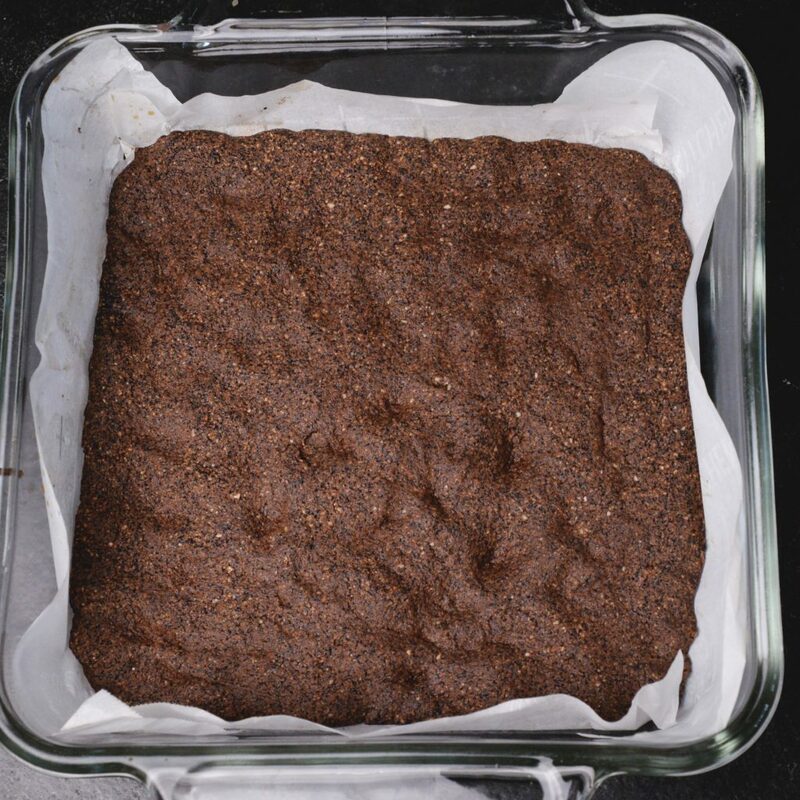 The final result is a simple delicious dessert that won’t blow my macros. This recipe is super simple to make, but I want to point out that you need to be careful with the amount of sweetener. I actually used a sweetener called Just Like Sugar Baking Blend in this recipe. I don’t have a partnership with this company, but I happened to have some in my pantry. The reason I used this over my favorite sweetener (Pyure-which I also don’t partner with, by the way) is that it’s powdered and dissolves better that the granulated Pyure that I usually use. I really like the taste of Just Like Sugar. It’s clean and has no aftertaste or cooling effect. The only thing that I don’t like about it is the price. Since it’s less sweet than sugar, you need to use more of it for the same sweetness, adding to the cost. If you only have the granulated erythritol/stevia blend of Pyure, you can use that. Just be sure to decrease the amount (since it is quite a bit sweeter than “Just Like Sugar”) and process it in a food processor for several minutes to powder it like I do in the peanut butter mousse recipe. This will help it dissolve better. Any other powdered sweetener will work as well. Just be careful to adjust the quantity as different sweeteners have different sweetness levels. I added the sugar equivalents next to the sweetener I used so you have a guide to go by no matter what sweetener you use. 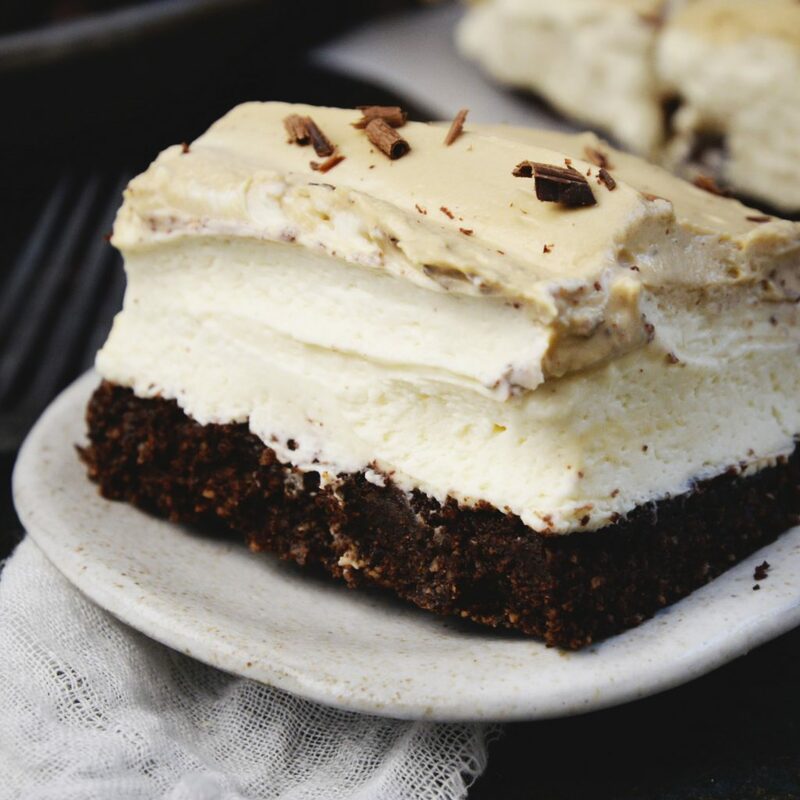 This Low-Carb Cappuccino Mousse Cake makes an elegant make-ahead dessert easy enough for a family meal, but elegant enough for company. Enjoy! Preheat oven to 375º Fahrenheit. 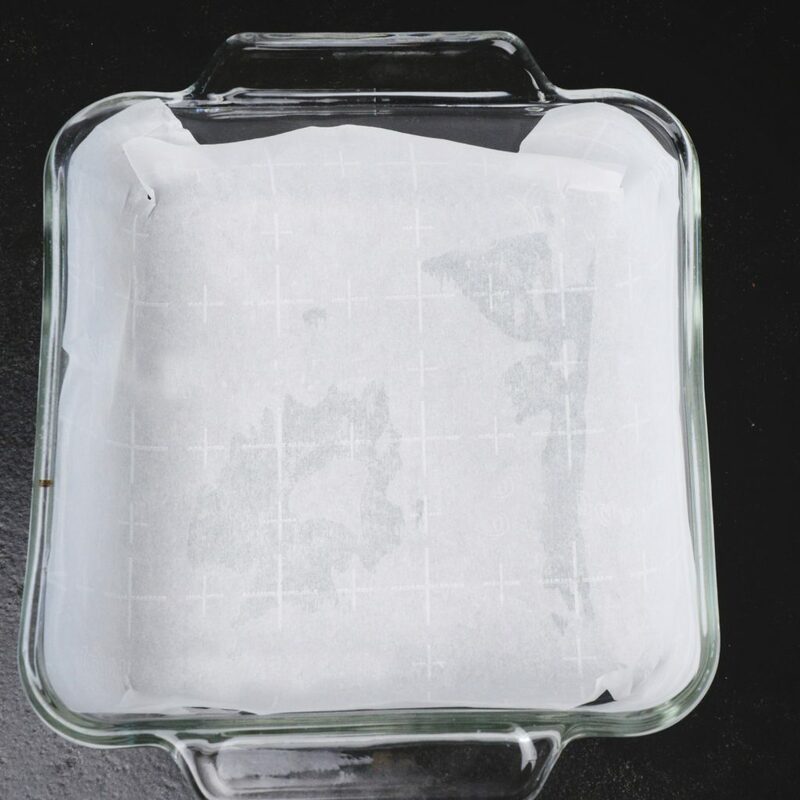 Line an 8 inch square baking pan with parchment paper. 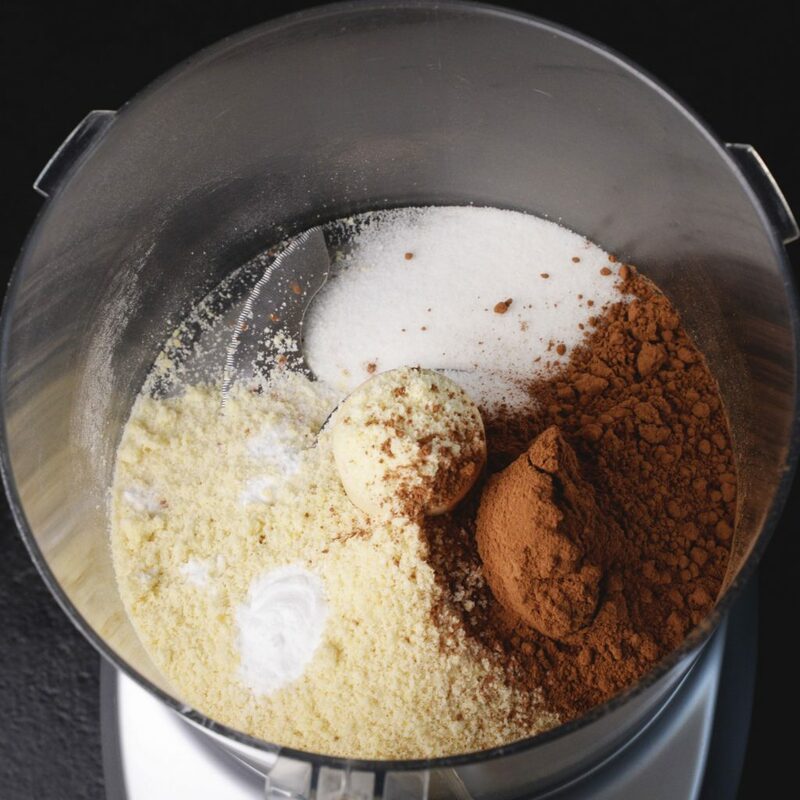 Add almond flour, sweetener, cocoa powder, baking soda, and sea salt to a food processor. Pulse to combine. Add vanilla extract and butter. Pulse until a ball of dough forms. Press dough into the bottom of the prepared pan. Bake in the preheated oven 12-15 minutes or center has a bit of resistance when very lightly touched. Allow to cool completely before continuing. 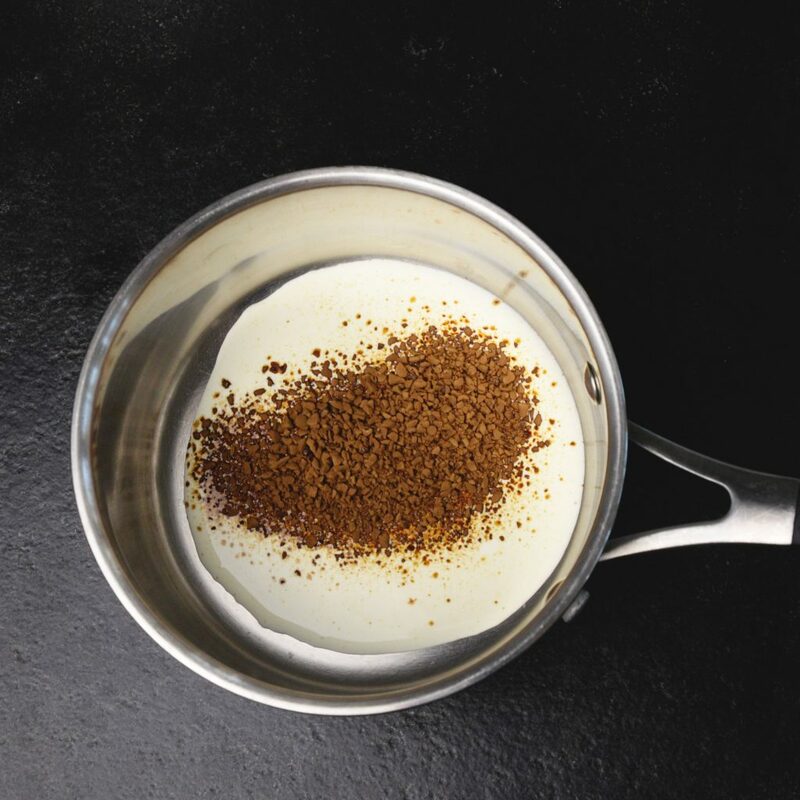 In a small bowl, stir together two tablespoons of the heavy cream and the coffee granules. Allow to sit to let the granules dissolve and continue to the next step. 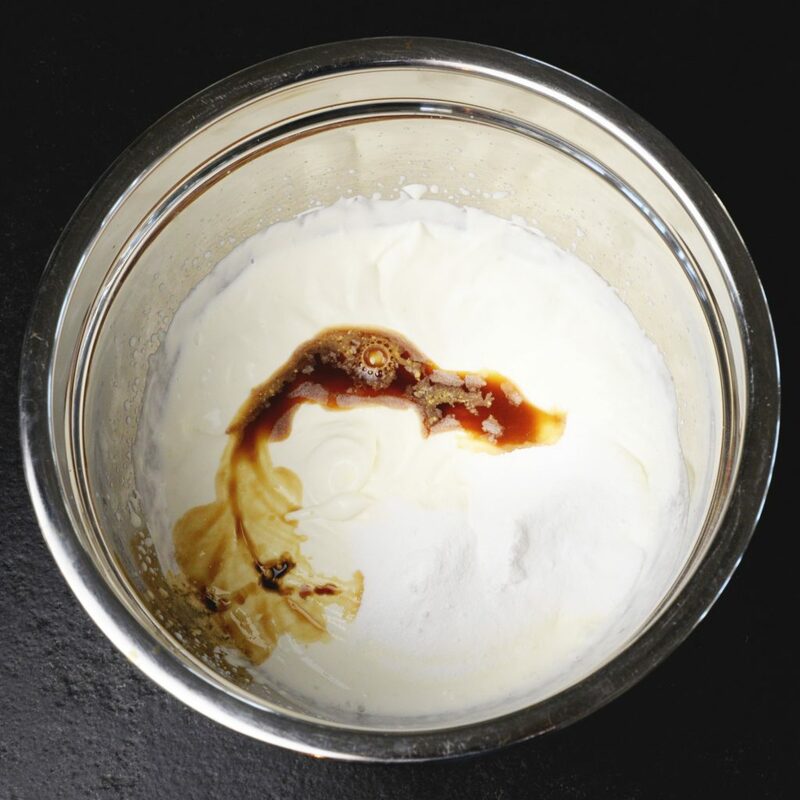 In a large mixing bowl, beat the cream cheese and sweetener together on low speed to combine. After they are combined, mix on high until fluffy. 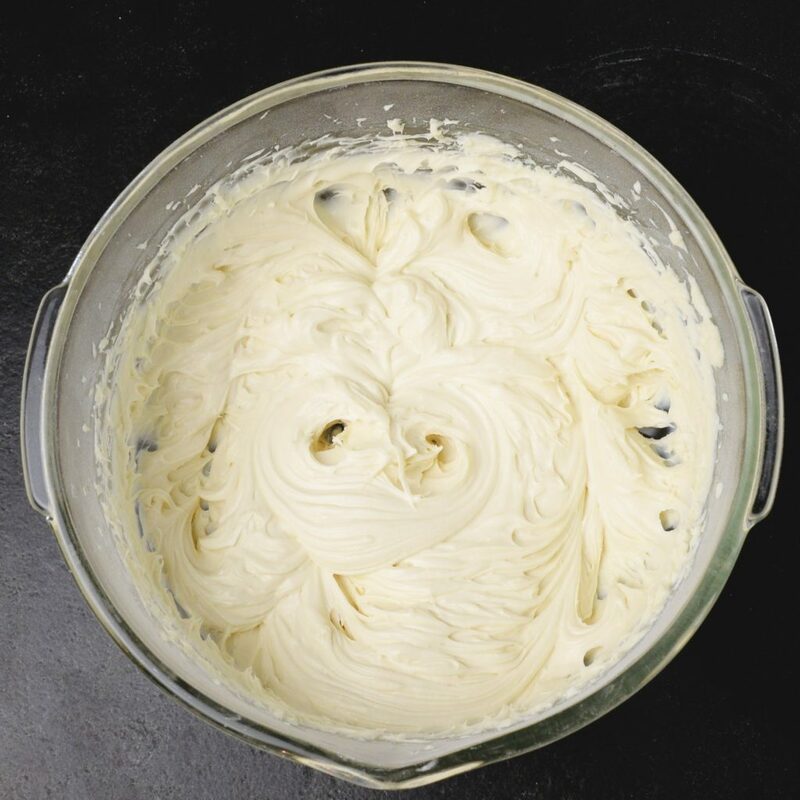 In a medium mixing bowl, beat one cup of heavy cream until soft peaks form . Add the remaining 2 tablespoons powdered sweetener. Beat until stiff peaks form. 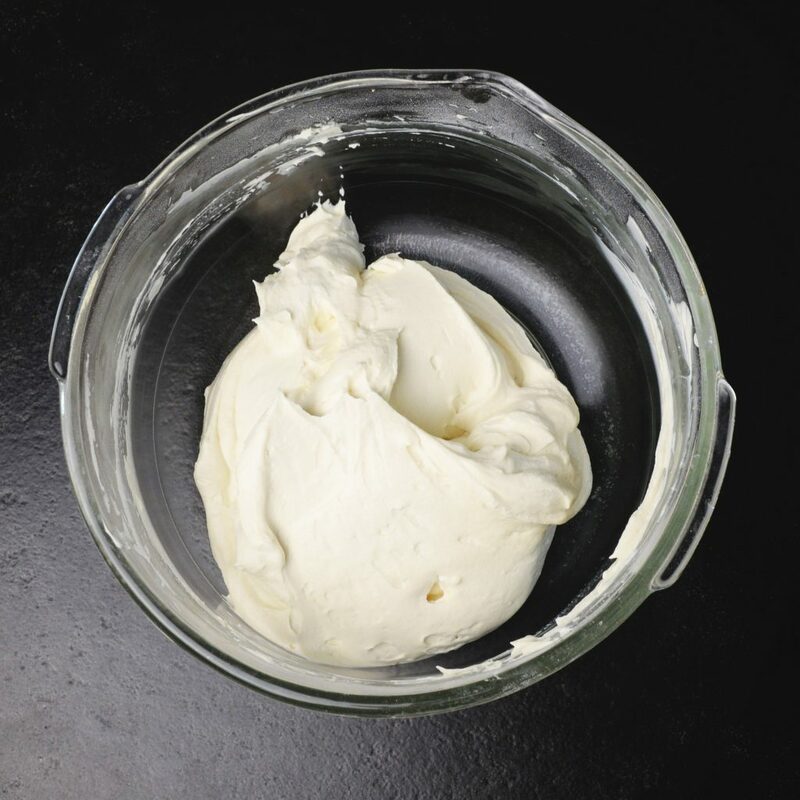 Fold 1/3rd of the whipped cream into the cream cheese mixture to lighten, then fold in the remaining whipped cream. Spread about 3/4 of the whipped cream and cream cheese mixture over the cooled crust. 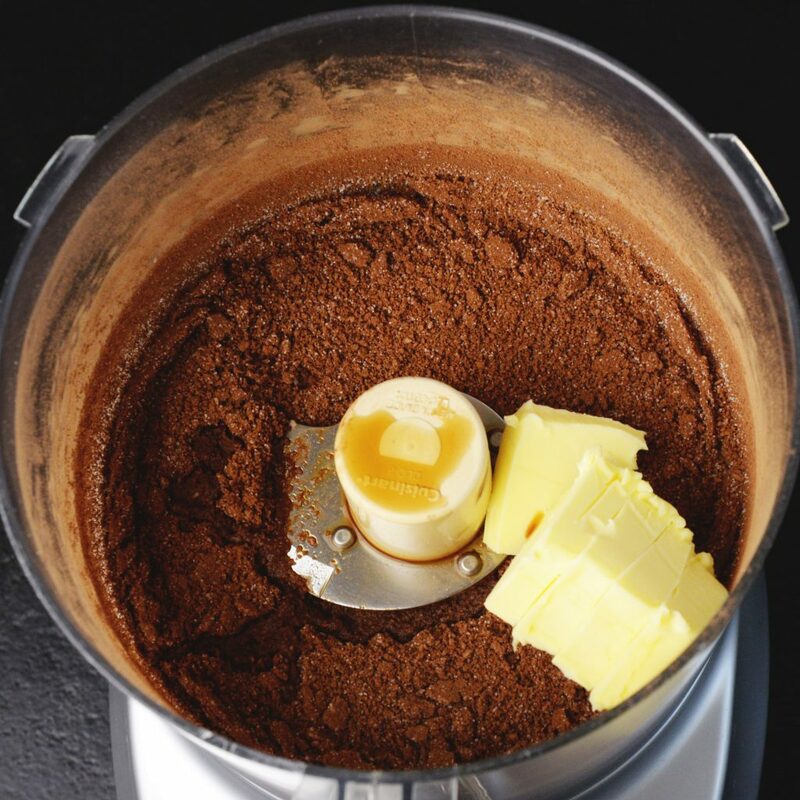 Stir the coffee granule mixture until the granules are completely dissolved. 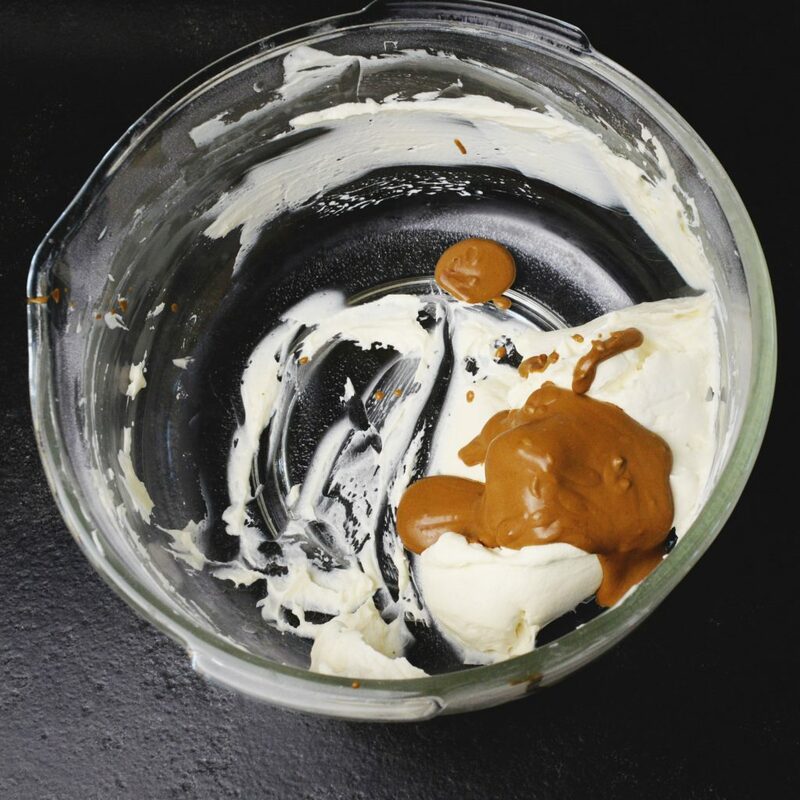 Stir this mixture into the remaining whipped cream/cream cheese mixture. Spread the coffee mixture over the plain mixture, swirling as desired. Cover and refrigerate for 4 hours or overnight before serving. If desired, garnish with chocolate. Cut into 12 pieces. * If substituting sweeteners, please adjust the amount according to sweetness level. 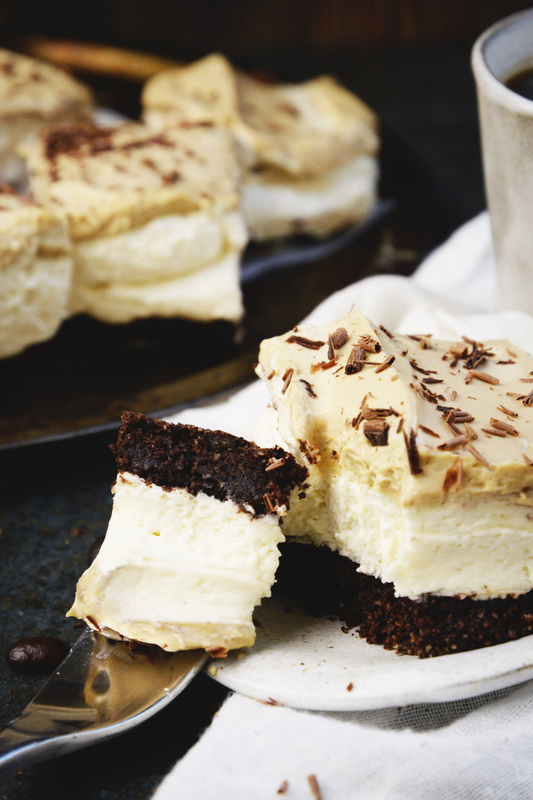 Oh wow – this recipe looks super indulgent! I love the idea of mousse with cake and these flavors are just perfect! 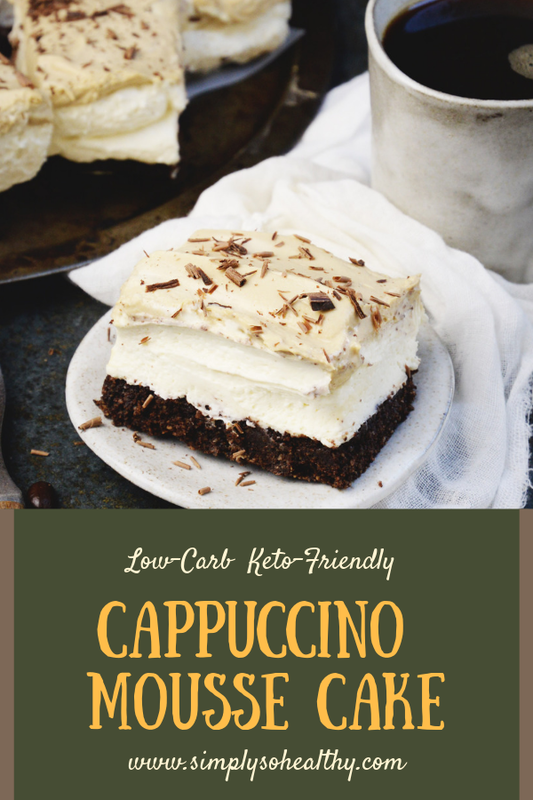 I can’t even believe this cappuccino mousse cake is low carb. It is beautiful and would be perfect for serving at any party. Thanks! It really would make a great party dessert. This mousse cake looks absolutely beautiful! 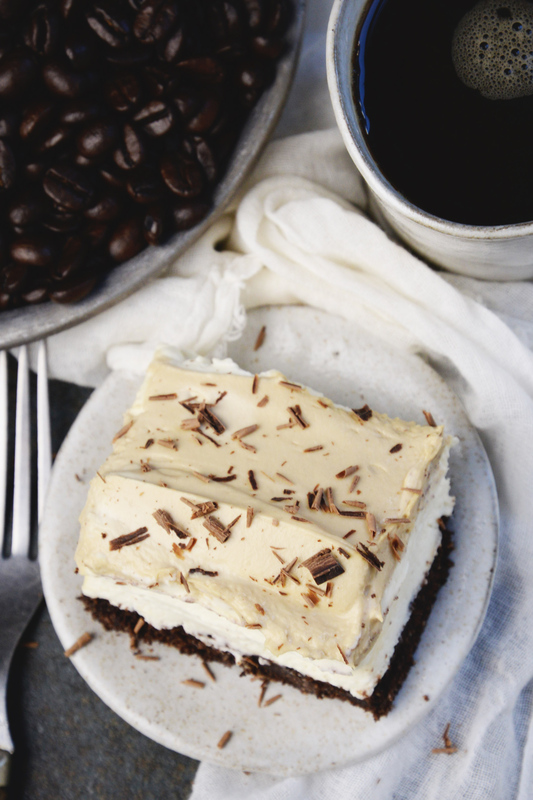 I love the combination of chocolate and coffee, plus the different layers! this is perfect! I usually dont eat dessert but I would devour this one it looks fantastic! I just love the flavors in this gorgeous dessert! I am going to make it for my husband for Valentine’s Day! Thanks for the inspiration! It’s perfect for Valentine’s day! Looks so delicious and decadent! 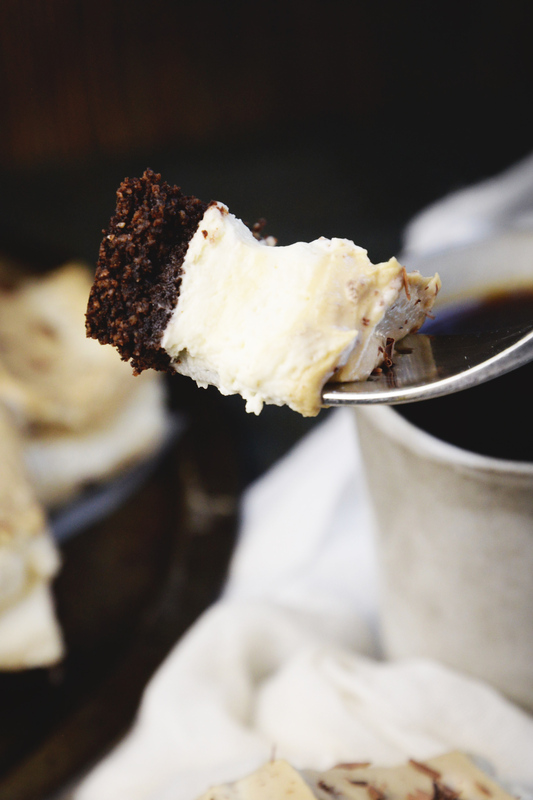 I love coffee desserts! Thanks so much! I’m still licking the plate. I can’t wait to create this amazing looking dream! I’ve had it bookmarked on my home page for several days only due to the “in a food processor” instruction. This can be made by hand? Or with a mixer? Please say yes (and feel free to add any and all words of wisdom”)! Theresa, I think this would be fine to make without a food processor. It may take a bit of elbow grease to bring the dough together. I would mix the dry ingredients with a whisk, the cut the butter in with a pastry blender (like you would for biscuits). You may need to squish the dough together with your hands and kneed it once or twice to make sure it is completely blended. Good luck and let me know how it goes! Thank you! I most certainly will let you know! Hopefully my tomorrow bake! Thanks so much for your feedback! I haven’t used allulose yet. I’ll have to check it out!